The Schwarze A-7000 is a heavy duty, chassis-mounted, regenerative air sweeper with an 8.4 cubic yard hopper. This highly efficient system insures that even hard-to-reach particles hidden within pavement cracks and irregularities are removed including the “PM-10” fines known to contain a high percentage of heavy metals and other pollutants. Recent studies emphasize the importance of removing these PM- ‘fines’ due to the non-pointed source pollutants they contribute to storm water runoff. Using the regenerative air sweeper results in a cleaner street and a cleaner environment. The Schwarze M-5000 is a heavy duty chassis-mounted broom sweeper with a 5 cubic yard capacity hopper. The machine is suited for a wide-range of sweeping applications from routine street cleaning, to heavy duty sand clean–up. 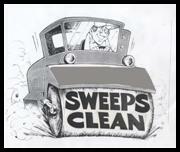 The biggest advantage of this broom sweeper is its capability of cleaning heavy debris areas. With its high dumping hopper, capable of dumping into the highest sided quad axle dump trucks, this sweeper demonstrated its capabilities under a very wide range of sweeping tasks. These versatile small sweeper units provide the bread and butter capabilities of the sweeping business. They’re highly maneuverable allowing efficient operation in places where the bigger units can’t work, such as parking garages. These machines are equipped with fan housing air diverters which allows adjustment of air flow to pickup light to heavy debris.